Librarian Little: The Sky is Not Falling!™: What is Mr L.R. Smith working on in the library and archives? What is Mr L.R. Smith working on in the library and archives? This year is the 100th anniversary of American involvement in World War I. In the library and archives there are more than 600 glass slides that date back to World War I . These slides were part of the collection of William R Webb Jr.
We have both the projector and the script that goes along with the slides. 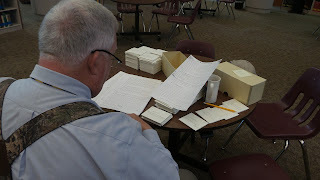 Mr. Smith is doing the tedious work of cleaning, identifying, and digitizing the slides.